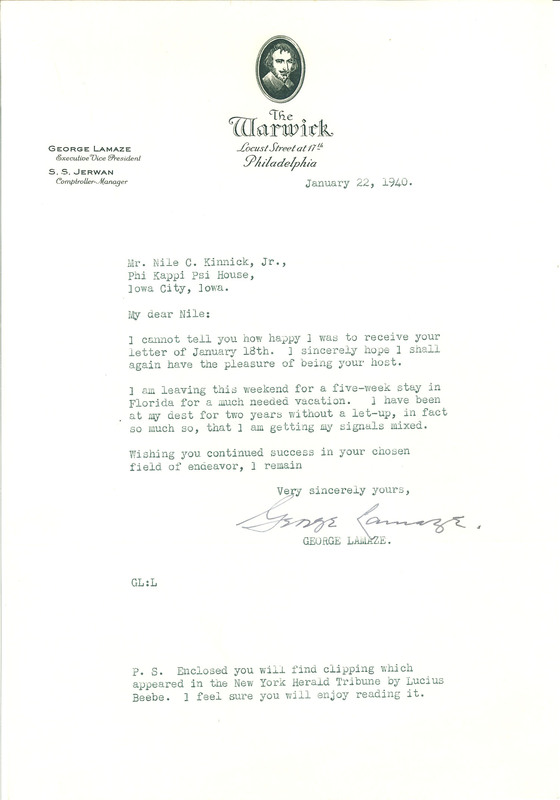 The Warwick Locust Street at 17th Philadelphia George Lamaze Executive Vice President S. S. Jerwan Comptroller-Manager January 22, 1940. Mr. Nile C. Kinnick, Jr., Phi Kappi Psi House, Iowa City, Iowa. My dear Nile: 1 cannot tell you how happy I was to receive your letter of January 18th. 1 sincerely hope 1 shall again have the pleasure of being your host. 1 am leaving this weekend for a five-week stay in Florida for a much needed vacation. I have been at my dest for two years without a let-up, in fact so much so, that I am getting ay signals mixed. Wishing you continued success in your chosen field of endeavor, I remain Very sincerely yours, George Lamaze. GEORGE LAMAZE GL:L P. S. Enclosed you will find clipping which appeared in the New York Herald Tribune by Lucius Beebe. I feel sure you will enjoy reading it.